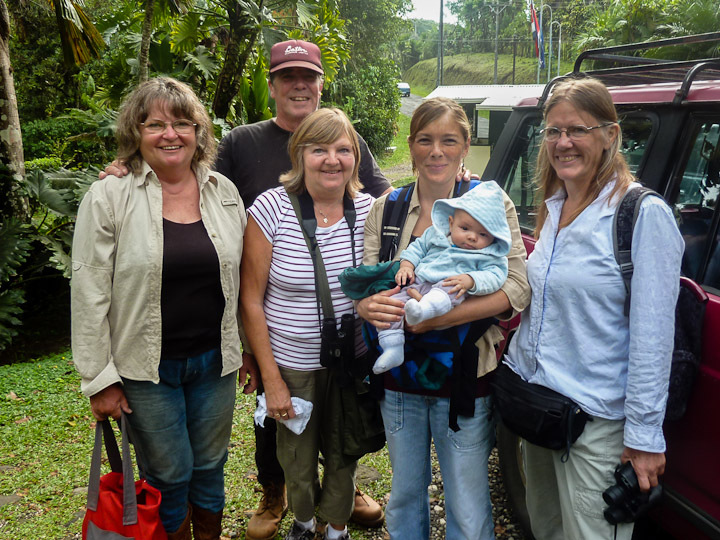 Several new member and guests joined our recent bird walk in the Wilson Botanical Garden, including the youngest member of the SVBC, Elias Castiblanco U., participating with his mother, Kathleen Ulenaers, and grandmother, Philomen Schutters. New member Barbara Keeler Barton joined us for the first time as did Morphose Mountain Retreat guests Celia Lucente and Randy Bonsignore, vacationing here from Florida. As for the birds, for the second time in as many months we spotted a handsome Rufous-winged Woodpecker actively foraging near the entrance gate. Other favorites of the morning were two perched Blue-crowned Motmots, possibly a pair, and a White-crowned Parrot that obliged us by sitting still for several minutes on a palm trunk stump. Although new member Wally Barton did not actually walk with us, he did make it for “Coffee-and-the-List” and found the last bird of the morning, a male Yellow-faced Grassquit, bringing our total to 35 seen or heard species on our one hour and 45-minute outing. Don’t miss the fun: join us for the next walk on May 26 at 7:30 am at the main entrance to the Wilson Botanical Garden! This entry was posted in Bird Walk Reports and tagged Rufous-winged Woodpcker, Wilson Botanical Garden, Wilson Walk by AWOlivieri. Bookmark the permalink.